On September 13, 2017, themed on "Smart City, High-tech Agriculture and Food Processing, Youth Innovation", the 8th China (Sichuan)-South Asian Promotion Round-Table Conference was held in Chengdu. The conference was sponsored by CCPIT, People's Government of Sichuan Province and SAARC, and organized by CCPIT Sichuan Council. Zhu Hexin, Vice-governor of Sichuan, participated in the conference and gave his speech. On behalf of South Asian commerce chambers and associations, Suraj Vaidya, President of SAARC, gave his speech on behalf of South Asian commercial associations at the conference. Li Gang, president of CCPIT Sichuan Council, convened the conference. 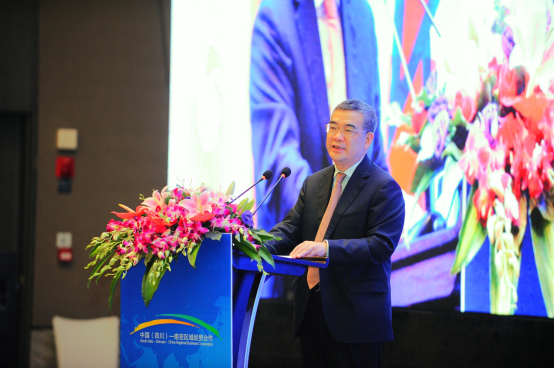 In his speech, Vice-governor Zhu Hexin said that Sichuan is standing at the new historic point answering the country's "Belt and Road" Initiative, and "opening southward" is the key overseas market development strategy of Sichuan CPC Committee and Sichuan Government. 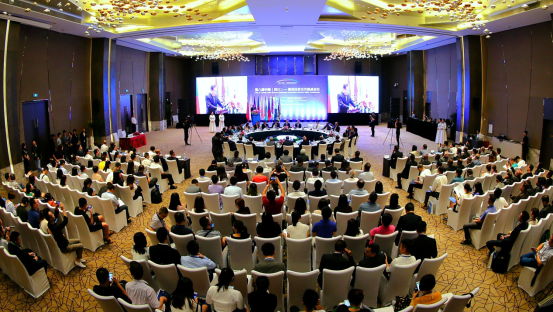 "South Asia Round-table Conference" has been successfully held for 8 years and has placed a platform for the promotion of bilateral economic and trade exchange and cooperation, acting as a bridge and hub for Sichuan's "opening southward" strategy. He emphasized that Sichuan needs to utilize its advantages to form a common vision and combined efforts in deepening of opening-up and cooperation. It needs to stand on a more open stage through reform and scientific development under the strategic vision of "internal reform and open to the world". First, set up a bilateral long-term cooperative mechanism. He hoped all parties will utilize the "Round-table Conference" to promote mutual visit and communication on policies, economic, trade, cultural communication and standardization; mutually support the setup of economic organizations and offices; jointly solve existing problems like trade products fields limitation and lack of by-products and services, and thus to provide effective supplies. Second, both sides need to focus on cooperation in advantageous & complementary industries with each other. Sichuan will actively stimulate its major enterprises and projects to participate in South Asian countries' city construction, agriculture development, and talent exchange at a higher level, so as to strengthen industrial cooperation and expand the market. Third, both sides need to promote mutual investment and cooperation. He hoped South Asian commercial associations can bridge Sichuan enterprises with South Asian enterprises on software, medical field, agriculture, tourism cooperation, and promote enterprises mutual investment and cooperation. Suraj Vaidya, president of SAARC Chamber of Commerce and Industry, said in his speech that under the "Belt and Road" Initiative, South Asia is faced with its best developing opportunities. There is a big market in South Asia, and great potentials as well. 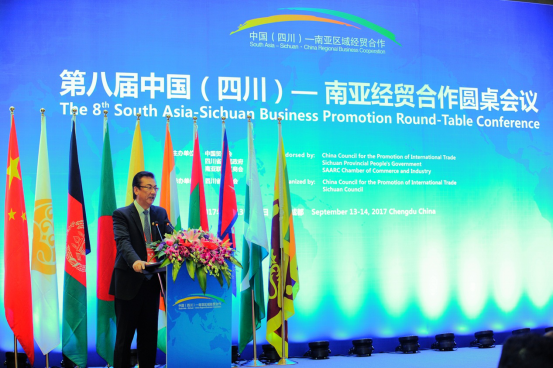 Under the constant promotion of "South Asia Round-table Conference", South Asia and Sichuan have set up cooperative platform of mutual trust, mutual act, and mutual benefit. Regarding South Asian countries' economic development, there are needs for city construction improvement and agriculture development cooperation. There are rich young labor forces and talents, and he invited more Sichuan enterprises to explore the south Asian market. South Asian commercial associations are willing to work with Sichuan Government and CCPIT Sichuan Council on wider and further substantial cooperation, especially furthering regional cooperation. He is willing to make SAARC a bridge and hub for Sichuan enterprise entry to South Asia market, and sincerely welcome more Sichuan Enterprises to explore, get acquainted with, and get rooted in South Asia. During the conference, Pakistan senator, Nepal ambassador to China, and representatives from various countries' commercial associations presented fine speeches concerning South Asian market development, regional cooperation promotion, etc. Zam Phub, president of Bhutan Industry and Commerce Chamber, said in his speech that he will strive to remove the bilateral economic and trade barriers through the civil efforts to provide a wider and more effective market for enterprises of the two sides. During the meeting, Sichuan Innovation and Entrepreneurship Promotion Association and SAARC Chamber of Commerce and Industry Youth Entrepreneur Forum signed an MOU, aiming to promote entrepreneurship of the two sides in regional economic, social and environmental sustainable development. Zhao Weiping, deputy secretary-general of Sichuan Provincial People's government, Lv Furong, vice president of CCPIT Sichuan Council, Wang Zhimin, CPC secretary, Zhu Xiaojin, deputy inspector, Cui Gui'en, deputy inspector, Huang Shan, vice president of CCPIT Yunnan Council, and about 400 people from South Asia, Sichuan province and other provinces in China attended the conference.